Fancy yourself as a coffee expert? Then come and witness some live roasting, try some coffee ‘cupping’ and sample some espresso martinis at Chimney Fire Coffee’s launch event at Battersea’s Square Gallery at SW11 3RA on 15th December from 6 until 10pm. Having worked all over the world on coffee sourcing and traceability projects, Dan understands quality coffee and the time and effort it takes to produce it: “Like with all traded goods, there is increasing emphasis on provenance and ethical standards. Our dream at Chimney Fire Coffee is to source high-quality, single-origin coffee directly from people we know and trust and deliver it to consumers who can appreciate the flavour profiles and the effort it takes to produce this brew we have come to know and love’. Chimney Fire Coffee’s mentality is not to simply sell a product but to give coffee drinkers the tools and information they need to enjoy the experiential art of coffee tasting, the same way we would wine-tasting. In keeping with this mindset, Chimney Fire Coffee offers ‘The Labin Coffee Tour’, through Airbnb, where you can learn the art of coffee cupping and hand roast a coffee blend to your personal taste. 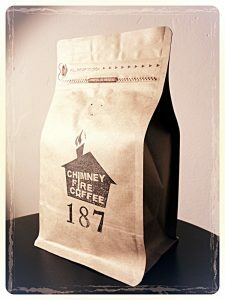 Go to www.chimneyfirecoffee.com to learn more about Chimney Fire Coffee, order some of their products, or book a Labin Coffee Tour. This entry was posted in Battersea and tagged coffee, event, launch by Blogger. Bookmark the permalink.